Summers have always evoked a special emotion in my mind. During my younger days, summers inevitably were associated with one big word – HOLIDAYS! Two long months of holidays when I can do all that I wanted and have no time pressures. No evening homework, no restrictions on play hours. Just pure fun and timepass all day. Retrospectively I think it would have done well if I had actually lived a Spartan life and enrolled myself in the multiple holiday coaching classes that kids these days do! Would have been proficient in paying the guitar at least. Anyways, as they say, it is never too late to hum a string! But well, I don’t have summer holidays anymore! One thing that makes everyone fond of the summers are the Mangoes. 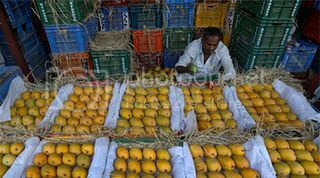 The option of “Har Mausam Aam” is good during off season, but in the summers it has to be the real Mango in every variety – Alphonso, Langda, Dussehri,etc any form would do. Summers bring in those fond memories of Nani’s house in Rajasthan. The two day long train ride in a sleeper class coach from Vizag to Sujangarh, via Delhi was an event that we had looked forward to, not worrying about the heat. The mangoes at Mama’s shop were an added incentive! Coca-Cola. Little did I had of then that one day I would be so strongly associated with this brand. Summers implied that any number of glasses of Coke would be okay. Rasna still brings fond memories of the fights that I used to have my brother on who has he bigger glass. Comics. Summer Holidays implied that I can read comics for as much time as I want. As I grew older, comics turned to novels, magazines and the likes. One thing remained common though, Fun reading which replace the normal boring class books for these two months. I still remember the travel memories when I would stare at every wheeler book cart at every railway station longingly wondering why I can just not buy the entire shop. “I would own a book shop when I am older”, I would tell myself and bury my head back in my copy of Tinkle. In the present life, summers are like any other months, with a lot of heat added in the weather. The very thought of having to step out for normal chores brings in a bout of lethargy. In spite of all these inconveniences, summers would always be cherished. And am off to relish myself on a succulent ripe yellow Mango.